In the chicken run, there is no one else quite like Lucy! Lucy is a very clever and special hen. 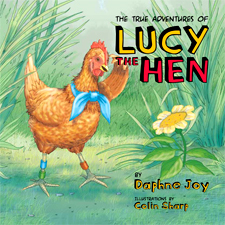 In this beautifully illustrated full colour picture book, Daphne Joy tells us some of Lucy's true life adventures. Exciting, sad, happy and humourous, these stories will fascinate children and give them confidence that they are loved and cared for. Each story concludes with 'Learning with Lucy' - bite-sized thoughts that apply the things that Lucy learns to our everyday lives. Softcover, 28 pages full colour. For ages 4 - 9.